Boulder Air Conditioning contractors talk about a SEER rating, what does that stand for? A. Seasonal Energy Efficiency Ration – Minimum Federal Requirements are 13 SEER for Air Conditioning Units. How can I qualify for Federal Tax Credit when choosing a new air conditioning system for may Boulder Co home? A. 16+ SEER Air Conditioning systems can qualify for Federal Tax Credit only with a Variable Speed Blower. Can I get air conditioning added on to my existing Boulder home air system? A. You can only add central air conditioning to your home air system if your existing furnace meets the requirements of supplying air conditioning into your home. Blower speed is key when adding air conditioning, most furnaces older than 1995 must need replacing to be able to handle the air volumes required to transfer cool air evenly. Since cool air wants to fall, naturally your blower must push harder to deliver cool air to homes with a second story. Does air conditioning have anything to do with my furnace? A. Yes. Your furnace delivers the cool air from your outdoor air conditioning unit. 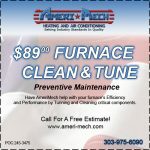 Using your existing duct work Ameri-Mech Heating and Air Conditioning sizes up your furnace and blower speed and determines what size air conditioning unit is required to cool your Denver area home efficiently. Is it necessary to get the air conditioning unit in my Boulder Co home serviced and how often should I get air conditioning service? A. Boulder air conditioning units (outdoor compressors) should be serviced annually. To ensure that the unit will provide the same energy savings from year to year, the compressor must be cleaned and serviced. Your indoor air coil must also be cleaned to allow maximum air flow into your air duct system. Call us at 303-975-6090 for answers to any other Denver / Boulder air conditioning questions you may have.